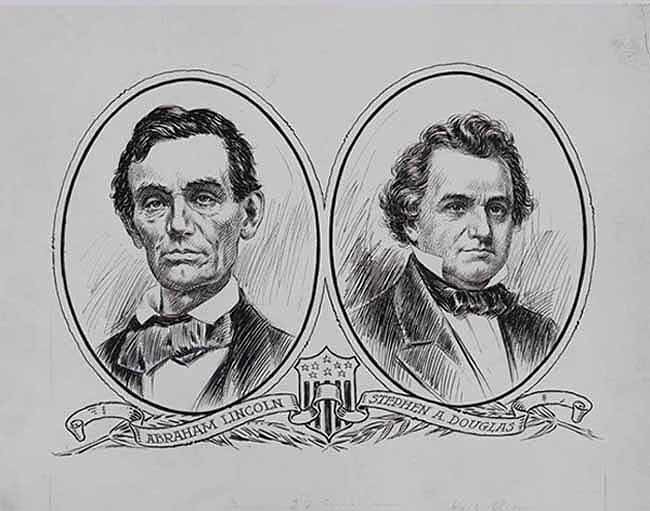 Lincoln-Douglas Debates: Briefly, they were a series of public and very well attended debates held in seven Congressional districts of Illinois prior to the election of 1858. The debates were between Abraham Lincoln (Republican candidate for Senate in Illinois) and Stephen Douglas (incumbent Senator and then front-runner candidate from the Democratic Party for President in 1860). Abraham Lincoln was, at the time, relatively unknown. At this time in history, prior to the 17th Amendment, a person had to be elected by the Illinois Legislature to win the U. S. Senate seat. No sound bites allowed: The debates were between two men directly — not the way our country has been conducting the debates during this Presidential campaign where questions are asked by the media. In a Lincoln-Douglas debate, the candidates will ask and answer each other directly, face-to-face. Newt and Herman will not be limited by 30 to 60 second time limits and commercial interruptions. No teleprompters will be allowed. Nobody bored: In 1858 when the Lincoln-Douglas debates were held, no apathy nor boredom occurred among audience members because the debates were extremely well attended with lots of excitement among the crowd. 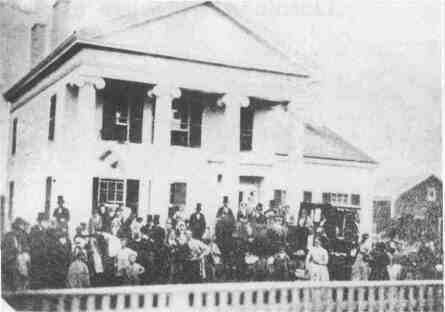 Numbers of attendees ranged from 6,000 to 15,000 depending upon where the seven debates were held, sometimes exceeding the number of residents in the town itself! People took their right to vote in elections quite seriously, and with the vote came the responsibility to understand the candidates' positions on issues. Slavery-for and against: The largest single issue of the day was slavery. Democrat Douglas argued passionately that slavery must be protected, and he could not imagine giving Blacks citizenship rights. He argued that slavery had reached its “natural limits” due to climate and soil conditions. Then unknown Republican and former Whig Abraham Lincoln just as passionately argued in reference to the now infamous Dred Scott Decision by the US Supreme Court saying, “A house divided cannot stand.” Lincoln had learned this while reading Mark 3:25 by candlelight in his log cabin. The Dred Scott Decision, which Democrat Douglas supported, ruled in part that no person of African ancestry could be a citizen under any circumstances or legal avenue. Lincoln was on the side of freedom (as were many of the day), pointing to the Bible and the Constitution as demanding it. Lincoln warned that unchecked, the enslavement of men by other men would expand until both Blacks and Whites were effectively if not literally enslaved across the nation. Freedom won but Lincoln lost: Lincoln won the hearts and minds of Illinois; but due to gerrymandering by the Democrats and the fact that Senators were elected by the state legislatures and not by popular vote, Lincoln lost that 1858 election to Douglas. However, this was a “slip and not a fall” that catapulted Lincoln to the national spotlight and in just two years to the Presidency. Douglas also ran for the Presidency in 1860; but in a four-party race, he came in dead last, winning only Missouri. Fast Forward 153 years: This Saturday night we will have a historic return to the issue-oriented Lincoln-Douglas debate format. This debate could change not just the election but the way campaigns and issues are presented. Even if you are in far-flung places across the United States, I would highly encourage you to attend. If you cannot attend, please consider coordinating with conservative and/or Tea Party friends to send one of your local activists. The C-SPAN Network, WSB Radio Network and The Neal Boortz Network will offer fully televised and audio live broadcasts of The Cain-Gingrich Debate. This is historic: Hopefully I will see you there Saturday Night Live, on Nov. 5, 2011. How Can You Watch the Cain-Gingrich Debate?